With nothing todo other than looking for jobs online and doing some minor chores at the university its getting freaking boring by the day. This weekend was a good relief from the everyday stuff. 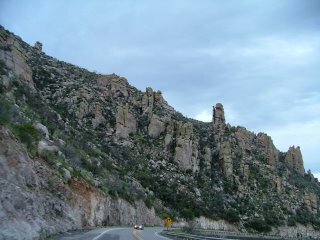 We arranged a trip to Mount Lemon, its some 30 miles from Tucson. Its scenic all the way right from the point where the first mountain starts and you enter the ghat. For the first time i saw z ig-zag roads and blind u-turns in the US...but i guess there isnt any option when you are making roads in steep mountain ranges. The first few hills that come along the way have a characteristic desert feel to them. As far and below you can see there are just cacti and white-chrome-yellow sandstone type rocks. But since it has rained for atleast past fortnight or so it was pretty grassy all around. As the elevation started rising to 5000 feet it got all cold and windy. The mountains started looking very very green. The cacti were replaced by conifers and there were waterfalls around ! The transition in surroundings surprises you, as desert now turns into European landscapes. When we reached the farthest top at 8000 feet it must have been 8-12 deg celcius. A phenomenal drop from what the temperature is down here in Tucson. Due to clear sky there are numerous observatories positioned here. Eye candy is infinite, but but but I dont have a camera...I am in one of the most beautiful towns and I dont have a camera. And I dont have a job...so that explains.